Who doesn't admire a nice rump. Well, its true for ships too. 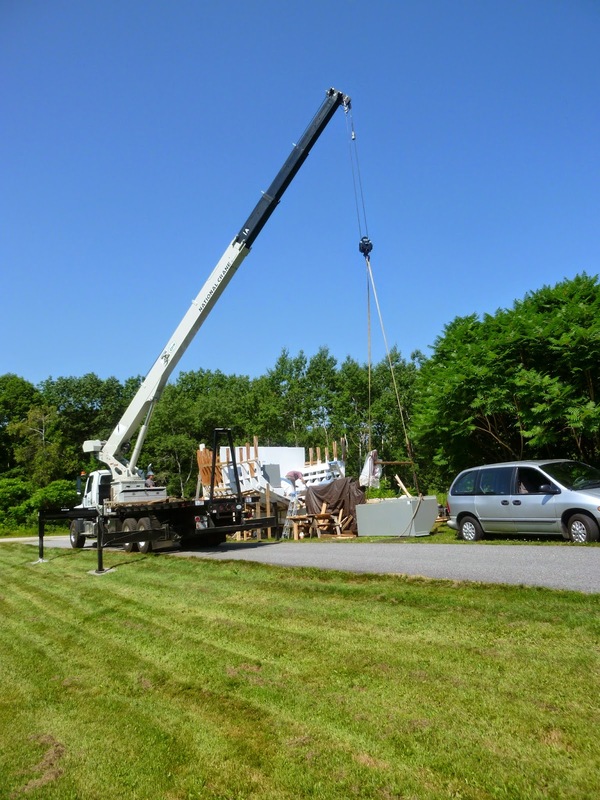 Here we are putting up the transom of "pile of wood". 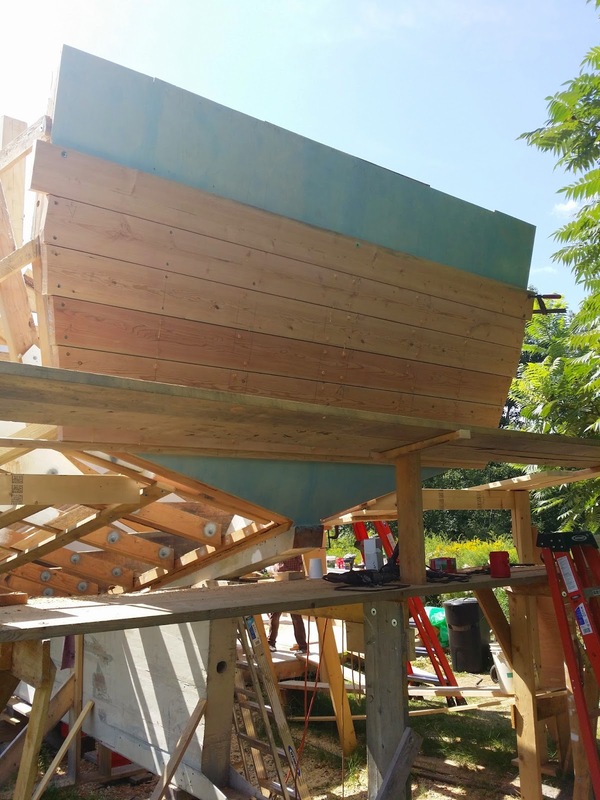 The transom actually tips backwards about 15 degrees and with planking added would be very heavy and awkward to lift into place. We start by making the framework much like the other frames. The "horn timber" or center piece of the transom is through bolted to a big Angelique knee that is bolted to the very back of the keel. Even without any ply attached, the framework probably weighs several hundred pounds. After it has been bolted in place we add on two layers of overlapping plywood and coat with a material that creates a waterproof membrane (the blue stuff) and then attach 2X8 doug fir planking for the nice planked look and attach with more goop and big galvanized screws. 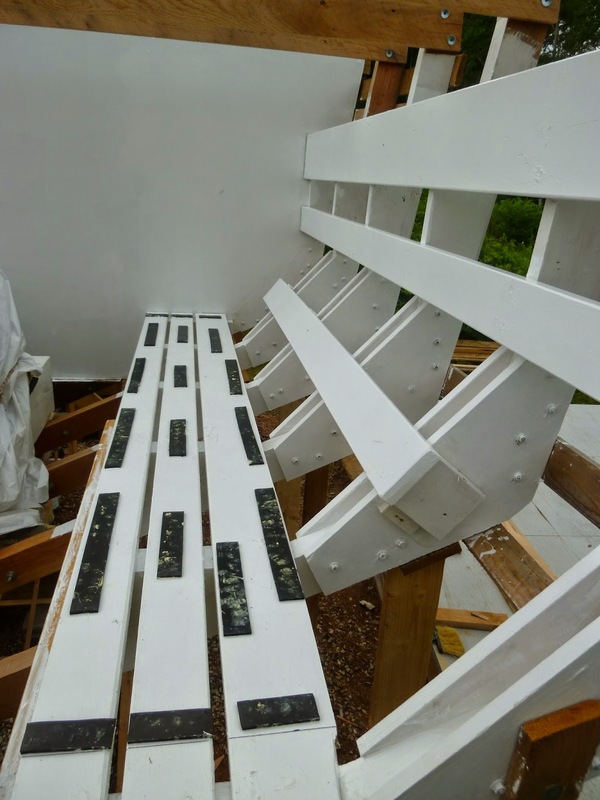 The screw holes are filled with wooden bungs that are cut flush and sanded. In the end, the transom will be painted to keep the "bright work" maintenance manageable. The fuel tank logistics were interesting. The first thing I did was to make my tankage as two large tanks rather than four tanks which were suggested in the design. I needed to move the engine room bulkhead forward one station to accommodate the larger tanks but I think it was a good swap of space to have a larger engine room and drop down to two tanks from four. They are 420 gallons apiece and constructed of 1/4 inch aluminum with baffles and inspection ports for a total tankage of about 840 gallons of fuel. 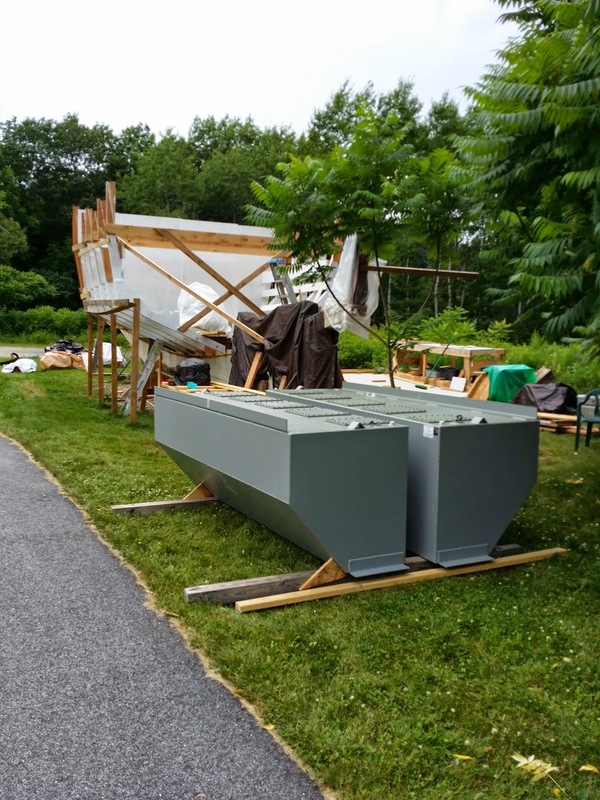 Though I try to do as much business here in Maine, the best deal I found was a welder in NJ who had also done the tanks for my friend Joe who is building the 44 foot Duck. To make the deal sweeter, Joe's brother in law has a place here in Maine and brought the tanks up from NJ. With a little finessing of some lifting chain we were able to get the tanks out of the truck with the neybah's Kabota, but dropping them in would require a visit from a big boy toy. Empty, the tanks weigh in at 750 lbs each. Full they will weigh close to 3000 lbs each so having them snug and secure is a top priority. I designed a wood cradle that is tied into the boat frames. The tanks are mounted on neoprene strips to keep water from getting trapped between the wood and the tanks. I had contemplated a day of dragging these bad boys up ramps with come alongs and such but ultimately wrote a modest check and had a crane company place them on the cradles in a little more than an hour with no scuffs, crushed fingers or other potentially disfiguring mishaps. As mentioned in a prior post, the frames were constructed over several winters in the cellar. 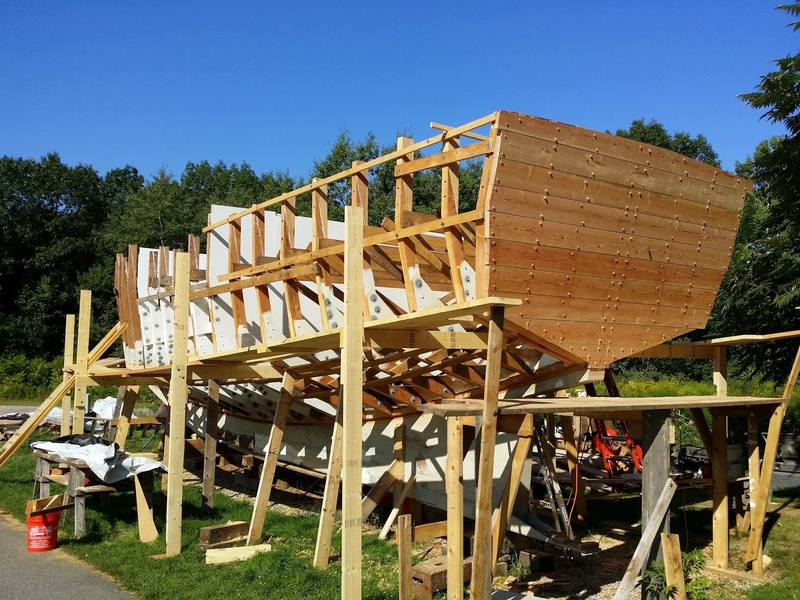 When the time finally came this summer, they were dragged down to the building site and laid out on the full sized framing table we constructed next to the keel. 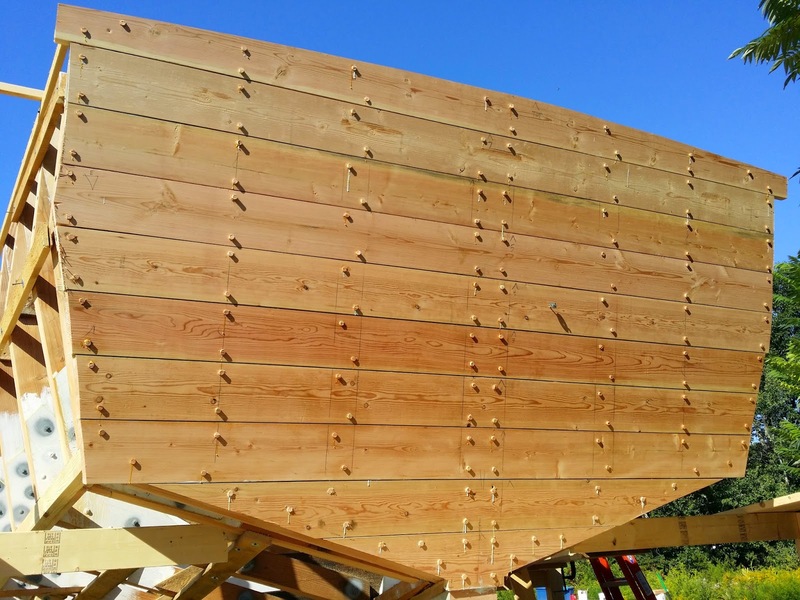 The two frame halves were "mated" and cross pawls were added to stabilize the frame shape as the were attached to their respective floor timbers. We started at the engine room where the engine had already been mounted and in anticipation of the fuel tanks which had just been ordered from an aluminum fabricator in NJ. In addition to raising the frames here, this was also the right time to put in the fore and aft engine room bulk heads. The bulk heads were to layers of screwed and glued 1/2 in MDO. The aft bulkhead was left off until the tanks were installed to facilitate their placement (next post). After the glue kicked screws were removed leaving us with a 1 inch final thickness laminated plywood bulk head. Then the remaining frames were put in place you can see the floor timbers primed for the forthcoming frames and then finally almost all frames standing. Frames were bolted to the the floor timbers with four 1/2 inch bolts (2 per side) and then strapping was screwed to the outside of the frames to stabilize them until the chine was attached.